Cartridge filters are the most advanced form of media filtration. Also using extended surface area, manufacturers of replacement filters are constantly developing and improving media technology used in cartridges. Offering high efficiency across a broad range of particle sizes, cartridge filters can be used for just about any dust collection application. 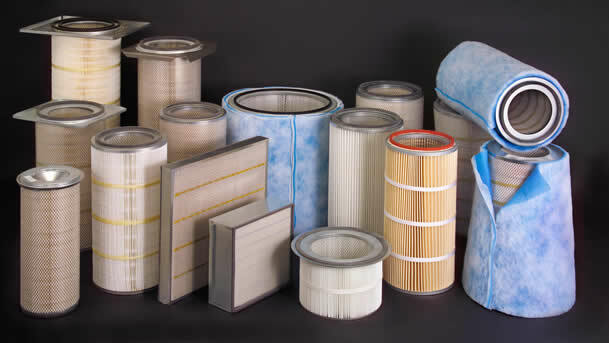 Cartridge filters are cylindrical shaped and open on one or both ends. Pleated filtration media wraps around the cylinder walls. When installed, one end is sealed off, leaving the open end as the exhaust. Air is sucked in through the filter sides and out the open end. Capable of reverse pulse cleaning, huge banks of cartridge filters can be used to continuously collect dust from a factory's central dust collection system.